“Here we have a story of injustice, betrayal and diehard survival,” begins Matt Gannon ’22. Three guys set out to the mountains, only to return 10 hours later with many miles under their feet and even more stories to share. Second hiker Robert Crawford ’22 jokingly echoes his friend’s description. “It was about friendship, fatherhood and coming of age,” he said. Hearing them talk ardently about the grit, trauma and alleged fun of their Cabin and Trail hike inspired my own trek to the snowy peaks. First, I must admit that I frequently — although with good reason — complain about the cold. During the beginning weeks of my first winter in Hanover, I adopted survival techniques not uncommon to the typical Dartmouth student. These strategies include the classic leggings under pants, “warmcutting” through Novack Café when en route to Webster Avenue, resting clothes on my room’s ancient heater to warm up and, finally, amassing pity by sending Snapchats of the Hanover temperature to friends back home. The one thing I have not mastered yet, however, is getting outside and having fun. Hailing from Virginia, a state which can barely claim a Northern title, it is safe to say that I am (owing to my origins) weak when it comes to the cold. So what was it that led me to embark on a seven hour hike on the second of February in the middle of the tundra? Conformity to friends, perhaps? Journalistic desperation? A summons by nature? Ignorance? Part of me wanted to be able to do what my three guy friends had done last weekend and without complaint. The week prior, Matt, Robert and their friend Andrew Culver ’22 accomplished an impressive Mount Moosilauke sunset hike, half of which was spent trekking in the dark with headlamps. I wanted the same experience, although maybe a little tamer: think Moosilauke–lite. Enter Mount Kearsarge. Matt and Robert agreed to join. “It’s really hard and not so fun while you’re doing it — but after, it’s great,” he said. When our van departed campus, my weather app displayed a -7 degree temperature. Over the course of the morning, it warmed up to a certifiably toasty 8 degrees. Our equipment comprised of Nalgenes filled with boiling water so they would not freeze, an abundance of dried mango and corn nuts, and winter overshoes with spikes to bear the slippery terrain. Boots ice-spiked, face fully balaclava-ed and body layered like a Russian nesting doll, I was ready to begin. The hike itself was moderate and not extraordinarily long, in hindsight. There were some icy, steep patches, but it was mostly well packed snow from previous trekkers. Don’t get me wrong, though: it still was no carefree dash to the top. The ascent was around three hours of careful steps and the occasional break for snacks or layering, while the return took only half as long and featured plenty of plunges into knee-deep fresh snow. The summit was by far the most challenging bit; up there above the tree line, the biting wind had the ability to pierce bones. The top is a flattish stretch of rocks and boulders, onlooking sheets of wind-polished ice and glass forests: the landscape almost Mars-like in a way. We stayed briefly to take photos for proof and enjoy the incredible panoramic views. Allegedly, on a very clear day, you can see the skyscrapers of Boston 80 miles away from the Mount Kearsarge summit. As I took in the sublime and sweeping view, I thought for a moment about my antagonistic relationship with winter. The winter, and this Granite state, offered something I had not yet realized: a chilly, invigorating power. The freezing weather is definitely a challenge, but that is where the beauty of winter arises. The challenge is to make good of conditions that are determined to oppress you. I noticed a simple purity in all that quiet on the icy summit. No mosquitoes or masses of people that come with the summer months. Only the untouched snow and iced-over signs. The whipping winds sent treetops flying, and the arid air stung my cracking lips. It is true that the winter months tests one’s mettle. But, at least at that moment, I was actually glad it was winter. As terribly trite and John Muir of me it is to say, maybe the mountains had taught me something. In order to make the most of Dartmouth winters, our only real option is to exploit the season. Rent some skis, throw on some skates or fill up a pack. 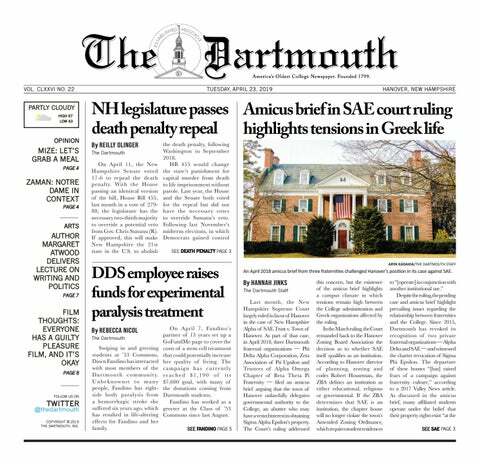 This school is very lucky to have the Dartmouth Outing Club, which sponsors so many winter activities, and even a winter sports club (which can be reached at hypothermia@darmouth.edu, if you’re interested). In comparison to many other winter pastimes that Dartmouth students take part in, like ice-climbing or spending nights in heat-free cabins, the hike I did was tiny, but it was not my last. Living in the tundra comes with its perks, and it is time that I start discovering them. Andrew Culver is a member of the Dartmouth Staff.